How to pan acoustic or electric guitar in the mix? Tags: Guitar recording and mixing techniques, Using panning effect in mix. In mixing session, it is important to correctly pan guitar in the mix. Panning is all about assigning a location in the stereo field with left to right user perspective (including center). Read this introductory guide on panning instruments in a mix. Inappropriate panning can result to mud or unrealistic guitar sound. The main objective of panning is to give a mix a realistic stereo image as if the listener of would be listening to a performing live band on stage. If you have been to live concerts; the guitarist are mostly found on the left and right side of the stage (live PA speakers are also located on that side). The live sound engineers do all pan the guitar performance on both left and right. 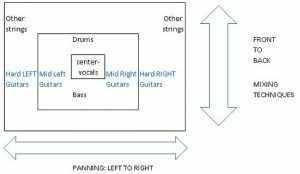 It is why you always hear the guitar sound far from the center and usually located in the left and right of the stereo field. The same concept when you are NOT mixing for live sound but mixing guitars for a recording project. “Hard” pan setting values are usually 85% to 100%. Mid pan settings are usually 50% to 85%. 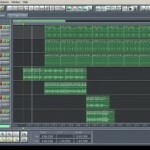 Most DAW software allows you to easily assign panning settings. To make an effective panning settings (which handles the left to right location of your tracks), you should consider the front and back audio mixing techniques. 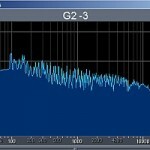 Front and back are usually enhanced using effects such as reverb, EQ and compression. Make sure that when you are panning guitars, you should also consider its front and back aspect in the mix. Numerically the center is assigned as “0” while the rightmost part of the channel is assigned as +100 and leftmost part channel as -100. 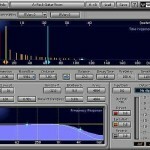 In some DAW the polarity sign might be opposite. For example, if you assigned a certain musical instrument at panning setting of “0”, it means that you have assigned that instrument in the center of the stereo. In other DAW, it uses percentage. So 0% means center pan and -100% could be hard left or hard right. You need to consult with your DAW software documentations for details about its panning feature as this would be different from every software. 1.) If you only have one guitar track, you should pan them equally in either left or right at the same panning setting value but in opposite. For example, if you start panning a guitar on LEFT 85%, then you should make a copy of that guitar and put it on the RIGHT 85%. This will ensure stereo balance of your guitar tracks.